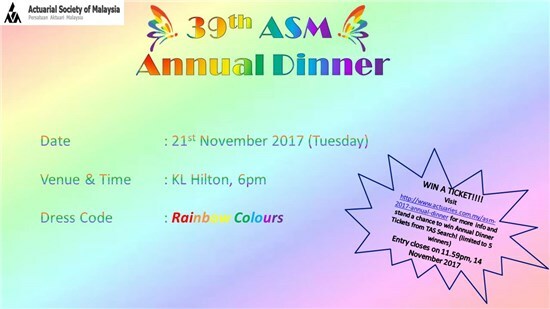 This year, we are sponsoring 5 tickets to 2017 ASM Annual Dinner (or a choice of Starbucks Card worth RM150). To stand a chance to win the prize, all you have to do is predict the closing FBM KLCI at the end of trading day 17 November 2017. The 5 closest predictions will each win a choice of one ticket to 2017 ASM Annual Dinner or a Starbucks Card worth RM150. In the event of a tie, the earlier submitted entry shall win the prize. You must be a member of ASM or an existing newsletter subscriber of TAS Search to enter into this competition. The Annual Dinner tickets are not transferable but you may instead choose to receive the Starbucks Card worth RM150. Hurry! Entry closes at 11:59 pm on 14 November 2017 (Tuesday). Given that it is harder to make your prediction if you submit way ahead of the deadline, we will reward early submission by expanding your prediction to +/- 2 points per trading day ahead of 14 November. For example, if you submit before the market opens on 14 November and make a prediction of 1700, we will treat your prediction to be in the range of 1698-1702. If you submit before market opens on 9 November (4 trading days ahead) and you make a prediction of 1750.23, we will treat your prediction to be in the range of 1742.23-1758.23. When we opened the competition on 3 Nov 2017, the FBMKLCI closed at 1740.93. It pretty much hovered in the +/- 10 points range for the next 10 days or so and closed at 1733.61, the day the competition stopped accepting further entries. The stock market then took a beating in the following day by dropping 11 points (as if we purposely chose the closing date to make the competition more challenging). At the close of Nov 17 trading day, the FBMKLCI was at 1721.66. Congratulations to our following winners! You have each won yourself a ticket to 2017 ASM Annual Dinner or a Starbucks Card with stored value of RM150 (as per your choice made in your competition entry).